Google has bumped off BETA word from logos of Gmail, Google Docs, Google Calendar and Google Talk. Gmail users have been so use to seeing BETA word on Gmail logo all this while. 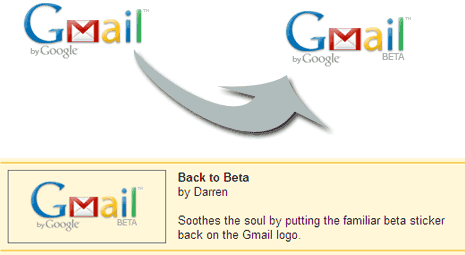 If you are missing the Gmail logo with the beta word, here is quick way to get “Back to Beta” for your Gmail account. Login into Gmail and click Settings option at top right. Then click on Labs tab and look for “Back to Beta” feature. Click enable next to it and then click save changes button. Your Gmail logo will again get the light grey BETA word written next to its logo. This will not change any functionality or feature of your Gmail account – just the old / new Gmail logo fun and play!